At Wickiup Cabins, our two person cabins are just right for the honeymoon or the rest of us lovers at heart taking a break from life in the Black Hills.. Welcome to Frontier. Frontier is our honeymoon cabin. It is considered a two person cabin and has a hot tub on the deck and sits next to the creek. Frontier has a queen bed, kitchenette with stove, fridge and microwave, bathroom, gas fireplace for heat, Broadband WIFI - limited, Dish TV, all bed linens, towels and basic cookware. Never miss a morning coffee with a coffee pot, coffee and filters supplied in your cabin. Renew your relationship or begin your new relationship, Frontier will help you make those memories. Bring personal clothing and food if you wish to cook. Memorial Day to Labor Day: $130/night Mon-Thurs, $155/night Fri - Sun. Off Season - $115/night Mon - Thurs, $130/night Fri - Sun. Plus a one time cleaning fee of $20. Please call for Sturgis Rally pricing and availability. Welcome to Ten Sleep. Popular for it's creek side views, it is considered a two person cabin. It has a queen bed, bathroom, kitchenette with stove, fridge and microwave, TV with dish network, gas fireplace for heat, Broadband WIFI - limited, all bed linens, towels and basic cookware. Never miss a morning coffee with a coffee pot, coffee and filters supplied in your cabin. Outside feel free to make use of your own picnic table and grill on the charcoal BBQ. Memorial Day to Labor Day: $110/night Mon-Thurs, $135/night Fri - Sun. Off Season - $95/night Mon - Thurs, $110/night Fri - Sun. Plus a one time cleaning fee of $20. Please call for Sturgis Rally pricing and availability. Welcome to Prospector. This is a 2 person cabin popular for it’s creek views. It has a queen bed, bathroom, kitchenette with stove, fridge and microwave, gas fireplace for heat, Broadband WIFI - limited, TV with dish network, all bed linens, towels and basic cookware. Never miss a morning coffee with a coffee pot, coffee and filters supplied in your cabin. Enjoy a nice day outside with a picnic table and make use of the charcoal grill. Memorial Day to Labor Day: $110/night Mon-Thurs, $135/night Fri - Sun. Off Season - $95/night Mon - Thurs, $110/night Fri - Sun. Plus a one time cleaning fee of $20. Please call for Sturgis Rally pricing and availability. Welcome to Timber Top. This is considered a two person cabin and as the name implies sits at the edge of the timber. It has a queen bed, bathroom, kitchenette with stove, fridge and microwave, gas fireplace for heat, Broadband WIFI - limited, all bed linens, towels and basic cookware. Never miss a morning coffee with a coffee pot, coffee and filters supplied in your cabin. Enjoy the outside of the cabin with your own picnic table and charcoal grill. Memorial Day to Labor Day: $100/night Mon-Thurs, $125/night Fri - Sun. Off Season - $85/night Mon - Thurs, $100/night Fri - Sun. Plus a one time cleaning fee of $20. Please call for Sturgis Rally pricing and availability. Welcome to Golden West. 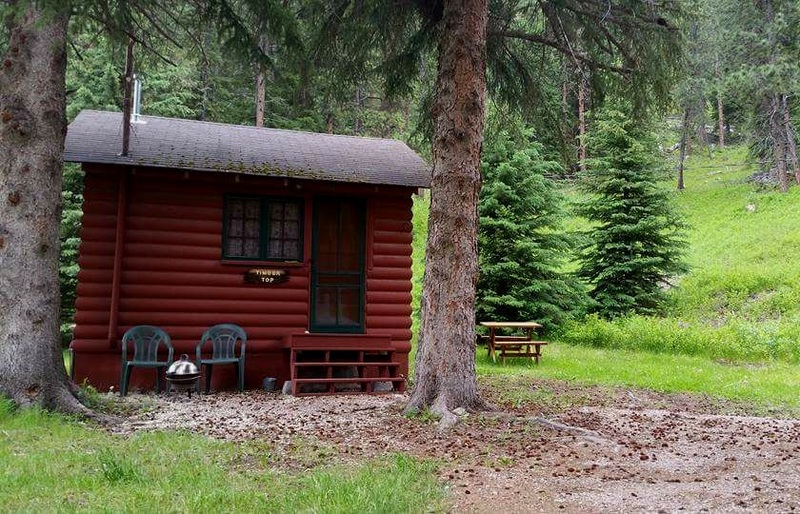 Golden West is considered a two person cabin and as the name implies sits on the west end of our property. It has a queen bed, bathroom, kitchenette with stove, fridge and microwave, gas fireplace for heat, Broadband WIFI - limited, all bed linens, towels and basic cookware. Never miss a morning coffee with a coffee pot, coffee and filters supplied in your cabin. Outside sits a picnic table and charcoal grill. Memorial Day to Labor Day: $100/night Mon-Thurs, $125/night Fri - Sun. Off Season - $85/night Mon - Thurs, $100/night Fri - Sun. Plus a one time cleaning fee of $20. Please call for Sturgis Rally pricing and availability. Welcome to Trailside. Trailside as the name implies sits next to the highway. But we can assure you that the sound of the creek on the other side of the highway will be a soothing sound to hear at night. With a whole new look, it is considered a two person cabin and has a queen bed, bathroom, kitchenette with stove, fridge and mic, gas fireplace for heat, Broadband WIFI - limited, all bed linens, towels and basic cookware. Never miss a morning coffee with a coffee pot, coffee and filters supplied in your cabin. Outside, enjoy a picnic table and charcoal grill. Memorial Day to Labor Day: $100/night Mon-Thurs, $125/night Fri - Sun. Off Season - $85/night Mon - Thurs, $100/night Fri - Sun. Plus a one time cleaning fee of $20. Please call for Sturgis Rally pricing and availability.